We’re a couple of city folks who moved to the country with dreams of pursuing a more sustainable lifestyle. This site documents the building of our net positive house (we hope to generate a bit more power than we consume each year). We were net positive for 2012, our first year in the house, and each year since. See posts for 2013, 2014, 2015, 2016 and 2017. In 2014 we won the NESEA Zero Net Energy Building Award. Estimated Cost (USD/sq. ft.): $142/sqf (estimated* = projected budget / enclosed space) *Not including significant site work. Actual Cost (USD/sq. ft.): $142/sqf (actual* = $300,000 / 2,112 sq. ft.) *Not including significant site work or mortgage related expenses. 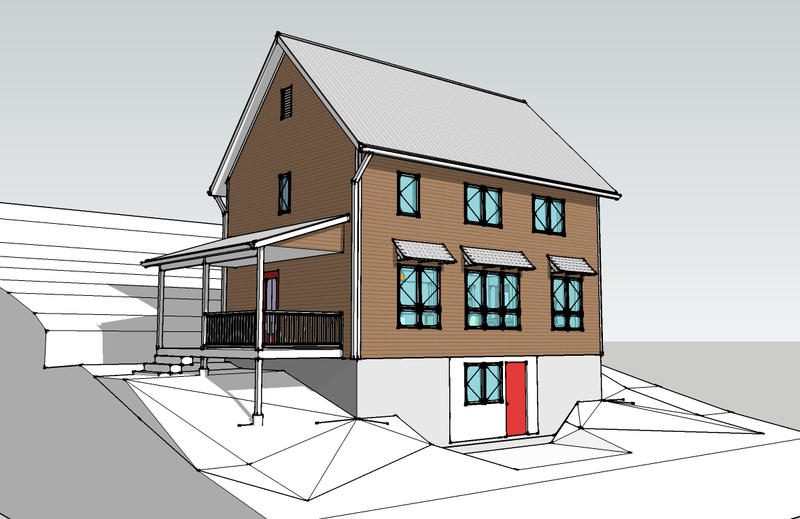 View the construction documents (1.7 Mb PDF). Updated 6 March 2011. Energy Star appliances and LED/CFL lighting. Solar PV: 30 – 230-watt Solar photovoltaic modules, totaling 6900 watts of peak DC power. Fronius IG Plus 7.5-1 UNI Inverter. This system will provide approximately 682 kWh per month on average. (We produced 719 kWh on average per month for the first year.) See solar related posts. Est. Space Heat Demand: 12,416 kBTU/yr. Est. Total Source Energy: 55,231 kBTU/yr. Est. Total Site Energy: 20,456 kBTU/yr. (5,995 kWh/yr. ), Actual for 2012: 5,601 kWh. Est. Hot Water Energy: 8,326 kBTU/yr. (2,440 kWh/yr. ), Actual for 2012: 1,528 kWh. Mechanical ventilation: UltimateAir RecoupAerator ERV. Replaced by a Zehnder ComfoAir 350 HRV on Nov 18, 2015. Trees removed from site were milled for future barn framing, house stairs and trim. The remaining hardwoods were bartered as firewood. Hi Dan, thanks for your comments. I think we met last year. We visited your house as part of the NESEA Green House Tour, which we’re participating in this year in addition to the Solar Tour. I’ll email you to find out more about the energy independence community. Thanks again. Thank you very much Richard. We spent some time pouring over your blog (nbsuperinsulatedhouse.blogspot.com) when were still in the early phase of construction. We enjoy documenting our thoughts and progress, and hope it helps more people contemplating building a new house to invest in a super insulated tight envelope. Thanks for reading! My girlfriend just found your blog and we’ve been researching almost identically what you have accomplished. The blog has been great. We are currently looking for property in that stretch of NY between Albany and Lake George. I spent many weekends of my childhood in the Catskills. If I may ask, what do you do for income? Do you have adequate savings you lean on until the farm is up and running (if you plan to make it a profitable venture)? It’s all like a puzzle to us and we’re trying to find and make pieces fit. That’s a great area to search, especially up near Lake George. In answer to your question, we both have full time jobs. I work from home and Jill has a publishing job about a half hour away. Farming is a hobby and educational experience for us, but we’re always scheming ways to transition at least part time to farming. You’re welcome to stop by for a visit. Good luck on your puzzle pieces. We would love to swing by for a visit. We may be in your very neck of the woods this coming weekend (3/16-3/17) if you are around. Sorry ’bout the short notice. Could you email me your contact info? Great blog thank you! Getting some great info I can apply to our Earthship build. We’ve had a couple of “what have we gotten ourselves into” days lately. Seeing your success has helped. Thank you for checking out our blog (spartanandhannah.wordpress.com). I imagine you smiled, much like I am right now looking at your blog! It seems we have followed similar paths. I think it is awesome when folks put up all this great information including detailed plans and analysis. I am sure that you have influenced more than a few people with it. Yes, I very much enjoyed looking through your site. You have a wonderful home. Looking forward to your continued updates. Congrats on a job well done! 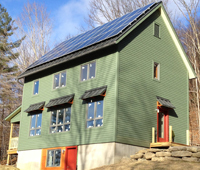 My wife and I are building a house in New Hampshire with energy efficiency in mind. Your site has been great inspiration. One decision we are currently making is attic ventilation. Our air seal will be at our 2nd story drywall ceiling and there will be r70 of cellulose in the ceiling joists. It seems like the best practice that we read about is soffit venting up to a ridge vent, but it looks like you went with gable vents? Do you also have a ridge vent in your roof? Our roof trusses are already on, roof is sheathed, and blocking is in….so just doing gable vents or gable&ridge vent would be easier, it seems. How did you come to decide on that attic venting approach? Did you feel your attic wouldn’t need the standard soffit to ridge vent because it won’t suffer the issues of poorly insulated and drafty houses? And more importantly, is it working out? Thanks for the excellent question. There are several factors that drove our decision to use gable vents. Primarily, because of the 12″ thick walls and 25″ of cellulose in the attic, there is no easy way for heat from the inside of the house to melt snow on the roof and cause ice damns. We also have a steep metal roof, so ice damns are not so much a concern there either. The house is also very tight, so we don’t have a lot of moisture vapor escaping into the attic. That’s not a big issue either because gable vents work just as well as soffit and ridge vents for ventilating moisture that may build up in the attic. We have nice big gables, a vent looks nice there in an otherwise empty space. And finally, I was doing a lot of the work myself and just thought a gable vent would be easier. I don’t know your particular wall/roof connection detail, but if your design is similar to ours, you might be well suited to a gable vent. Let me know what you decide. And congrats on building an energy efficient house! Excellent article on attic venting from GreenBuildingAdvisor, All about attic venting. Hi! My husband and I are planning a very energy efficient house in the region and would like to use the mini split air sourced heat pumps. We would very much like to talk to you about your experience with them. Hi Maria, congratulations on your decision to build an energy efficient home. I’d be happy to discuss our experience with our air source heat pump. I’ll email you directly. So glad to see you putting effort and resources into your net positive home. I set out on a quest for “self-sufficiency” 35 years ago as a suburban kid with dreams of returning to the land. I was diverted by solar energy in the late 70’s, and have made my career in it since. I’ve had plans to build a nice, small, snug, energy efficient home for years, having visited a passive solar home in CO, an intentional community in Truxton, NY with earth-bermed homes in the early ’80’s, worked on PV systems on a few straw-bale and earthship homes in CO in ’03, and visited the earthship community i Taos in ’05. It has eluded me, though, as partners have had different visions for our home. So glad to see you two working together to make this a reality! I lived outside of Cambridge until 11/13, and started a business last year to install solar electric systems. I’d like to visit your place, and invite you down to the Washington County Ag Park on NY313 and Palins Rd. to meet Ted Berndt, the owner of a former mushroom growing facility built with SIP panels. We’ll be installing a solar farm there. Please reply to Tom at LamprosSolar dot com. Thanks for the note Tom. I’ll be in touch shortly. Hi Jill and Larry. In researching goats on-line, I found you guys right here in the neighborhood. I live just off Chestnut Hill Rd on New Skete Lane. We are building a barn and I am looking for a companion for my horse for next Spring (2015). I have heard that a goat can be a good companion for a horse. Do you know anything about this and would you be willing to sell me one of yours? Hello, neighbor! Jill has also heard wethers (castrated males) are good companion animals, but don’t have any experience with it. We are breeding our does this month and expect Nubian kids in March/April of 2015. We will know then what our wether availability is like. Check back with us in the Spring! If we don’t have any available, we know other goat keepers in the area who may. Hi. You have an amazing house. Thanks for sharing. I’m interested in doing something similar, would it be possible to give you a call and ask a few questions? Thanks! Thanks Andrew. Happy to answer questions. I’ll drop you an email. Your netplusdesign.com has far and away the best metrics and presentation of any web-based home analytics page. I can only dream of having a house like yours that is worthy of that amount of data capture. “recepticals” as “receptials” on several pages. Thanks Steve! You are now my honorary editor. Thanks so much for your comments. Your home adventures are inspiring. Like commenter Andrew, I too have a bunch of questions I would like to ask you. Would you mind contacting me via email?